Starring: Oscar Isaac, Jessica Chastain, David Oyelowo, Albert Brooks and Alessandro Nivola. Set against the back drop of New York City’s historically most violent year (1981), this is director J.C. Chandor’s third feature, after last year’s Oscar-nominated Robert Redford-one-man-show, All Is Lost, and the previous year’s financial thriller, Margin Call. The title is misleading, perhaps deliberately so, as it is not a particularly violent film, rather punctuated with flashes of violence, including a shocking suicide towards the end. Oscar Isaac, an actor quite clearly in the ascendance (2014 was a very good year for him, 2015 promises to be even better: two words – Star Wars), is Abel Morales, a heating oil magnate, attempting to be an honest businessman in a dishonest market. His rivals seem to have it in for him, and Morales’ oil trucks are consistently targeted for hijack and theft, leading to one young driver, Julian (played by Elyes Gabel – recognizable as Rakharo from tv’s Game of Thrones), to take matters into his own hands with disastrous consequences, leading to one of the film’s murkier subplots. The crux of the narrative is Morales seeking to win the moral conflict, within and without, as well as the more incendiary business conflict. Of far more interest is the relationship between Morales and his wife (and sometime business partner), Anna, played by the once-again incredible Jessica Chastain. Their dynamic is the powerful beating heart of this film and turns what is essentially quite an ordinary crime thriller into a far more engaging character piece. It is a stylish affair, and the early eighties setting is subtle and never overly played. Costumes (and haircuts!) and locations are evocatively placed, enhancing the vice-like atmosphere that Chandor gradually builds (there is a great sequence where the Morales’ lush modernistic home is broken into whilst they are sleeping, that brings to mind Michael Mann’s Manhunter). Cinematography, editing, score and soundtrack, direction – everything about this film is understated and restrained, almost to the degree where you begin to crave more drama or perhaps a dynamic plot twist. This film provides neither, simply (or not so simply at times) playing itself as studious drama of complex moral themes. As a viewer you are rewarded with the satisfaction of seeing Isaac and Chastain spark off each other as the tension of their situation begins to take its toll on their relationship. How they have not been nominated for BAFTAs or Academy Awards is a mystery. 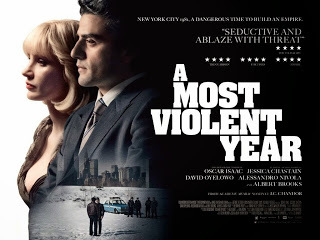 A Most Violent Year is, ostensibly, a thriller, and is structured as such, with a few great action set-pieces throughout. Great in the sense that they feel real; they are messy and bloody and have impact – the shootout on the highway, the chase through the tunnels, all are handled without any showboating from the director. Michael Bay, take note. But despite its thriller elements, it deceives us as an audience. The level of threat throughout is questionable. There aren’t, for example, any clear antagonists as such; threat is present through the mysterious hijackings that are sending Morales’ company into near-financial peril. There are a number of characters who seem allied (in their motives, at least, if not their tactics) against the Morales. Then there is David Oyelowo’s Lawrence, the relaxed-but-determined DA who is building a case against Abel Morales – he is not exactly a threat per se, as he, in one of his meetings with Morales, essentially warns the oil man and his lawyer, Andrew Walsh (played by the ever-green Albert Brooks), that he will be issuing his case within the week. Unbeknownst to Abel Morales, his wife, Anna, and his lawyer, Walsh, are in cahoots when it comes to legitimizing the company’s finances. Although he is no saint, Abel is determined to do things right, but seems to always be caught blind by the actions of his lawyer and, more frequently, his wife: there is one scene at the Morales’ home, at one of their children’s birthday parties, where Oyelowo’s DA, accompanied by a horde of police, search the house. We see Mrs Morales rope in her husband into helping hide boxes of dodgy documents in the drifts of snow beneath their house. There is also Alessandro Nivola’s Peter Forente, the most shadowy character in the film, who is either a duplicitous friend, or friendly rival; the actor plays this murkiness with great skill, and his scenes with Oscar Isaac radiate comradeship and menace. The acting throughout is marvelous, and Oscar Isaac and Jessica Chastain hold the screen with intensity and presence; the film is arguably less interesting when they are not around. Isaac’s performance here reminds me of a young Al Pacino, with that similar characteristic passion and borderline simmering restraint. Chastain goes from strength to strength, and each successive exceedingly well-picked role displays her skill admirably. Here, her Anna Morales is a tough Brooklyn girl who, whilst not quite being a duplicitous Lady Macbeth type, is the vicious yin to her husband’s earnest yang. Chandor is an intriguing director. With A Most Violent Year he once again shows he is a film-maker of range and vision, and his work here evokes Sidney Lumet’s American crime features (I’m thinking in particular of Serpico, Night Falls On Manhattan, and Before The Devil Knows You’re Dead). Its pace is well balanced but perhaps packs not enough punch for it to find a breakout audience. A great crime drama that succeeds, despite its low-key story, thanks to some superb performances. Review by Andy Jamieson, Editor-in-Chief of Geekzine UK.